With Claude Giroux as your teammate, it’s easy to get lost in the shuffle of “G’s” attention-grabbing skills and persona. But a career-high 62 points has Jakub Voracek growing into one of the league’s most dangerous offensive threats. And as the Flyers prepare to meet the New York Rangers in the opening round of the playoffs, another robust showing could make him a household name. The 2013-14 season has been the platform that Jakub Voracek has used to take his game to the next level. The six-year veteran has set career bests in goals (23) and assists (39), while matching his previous personal bests in plus-minus (plus-11) and power play goals (8). But having a knack for finding the back of the net isn’t the only thing Voracek brings to the Flyers. @richpatpaul Voracek should be better. Skill set there. Can't figure out shot selection. The -5 is a worry. With two years left on a four-year, $17 million deal, Voracek has used his role on Philly’s most consistent line (with Giroux and Scott Hartnell) to develop his already gifted skill set. Voracek’s increase in point production validates the attention he’s given to his shot accuracy. After scoring 18 goals in his first year in orange and black, Voracek has demonstrated that his words were not merely lip service. In last year’s lockout-shortened season, the then 23-year-old topped his previous year’s goal total by four, despite playing in 31 less games. And although he finished last year’s schedule with a minus-seven rating, Voracek is back on the right side of the plus-minus rating this season with a plus-11 rating. Since joining the Flyers in 2011, the Czech native has been a machine gun when playing against bitter rival Pittsburgh. His regular season and playoff totals against Pittsburgh include 14 goals and 15 assists. With Voracek emulating a Transformer against the Pens, it should come as no surprise who he recorded his first career NHL hat trick against last year. “Sometimes the bounces go in and sometimes it doesn’t,” said Voracek. “It’s been a while. I think the last time I scored a hat trick was Triple-A back home, I can’t remember. It’s been a while. Since joining the Flyers, only Claude Giroux has scored more regular season points against the Penguins with 32. On Saturday’s 4-3 overtime victory at Consol Energy Center, Voracek was able to narrow the gap to three with two goals and an assist. Given Voracek’s overwhelming success against the Pens, it’s quite perplexing he wanted to avoid them in the first round of this year’s playoffs. “Obviously, we don’t want to go for the wild-card spot because you have Boston or Pittsburgh waiting for you there,” Voracek said last week. Should the two teams meet up later on in the playoffs, Pittsburgh will likely be aware of where Voracek is on the ice at all times. That’s not to say they already haven’t tried. With only one career NHL fight under his belt, Voracek came unglued after taking a shot from Pittsburgh’s Tanner Glass on Saturday. The winner of the Yanick Dupre Class Guy Memorial Award as the player who best illustrates character is… Jakub Voracek! With Voracek’s third career crack at the playoffs, the Flyers will have to go through the New York Rangers without home ice advantage. But despite New York’s extended dominance at Madison Square Garden, Voracek was one of the first Flyer to speak words of confidence. Voracek will enter Thursday’s quarterfinal opener scoring points in four out of Philly’s last five games. With an assist in Sunday’s season finale against Carolina, Voracek will enter MSG on a three-game point streak. If this series is anything like the season series, it will be Voracek who will be one of the Flyers expected to ramp up his production against Rangers goaltender Henrik Lundqvist. In four games against the Rangers this season, Voracek has been neutralized, recording a single goal with a plus-one rating. 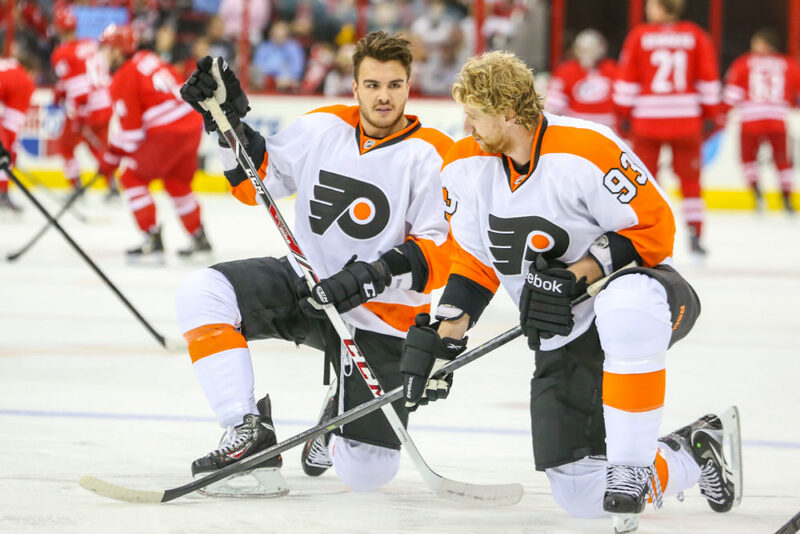 If the timing is, in fact, right, the Flyers are a team that can make a legitimate run. With Jakub Voracek growing into the player Paul Holmgren envisioned him to be, the NHL’s next real star could very well be revealed in the next two months.